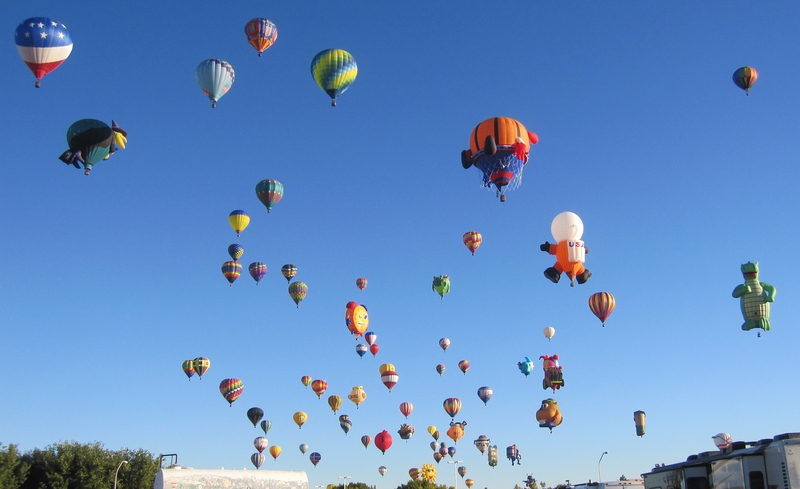 Last year I skipped the Albuquerque Balloon Fiesta. I was in New Mexico, at Bluewater State Park, but hadn’t made camping reservations with the Lazy Daze group, so skipped the area. 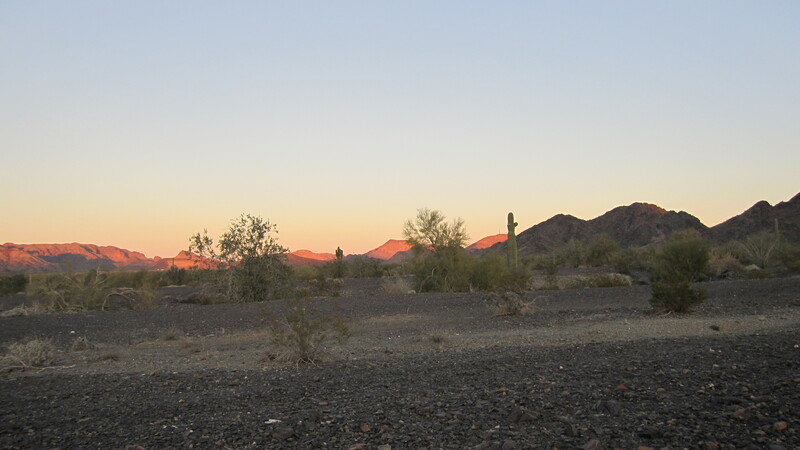 When it was over I went to Elephant Butte State Park, where I camped with Christine and Andy, then to Caballo Lake State Park, and had a great time with CB, Randy, Tish, Carol, Myrna, Laurie and Christine. (Really, it’s Chris, “Vermont Chris” as we call her, but I will call her Christine to differentiate from Chris of my recent posts.) 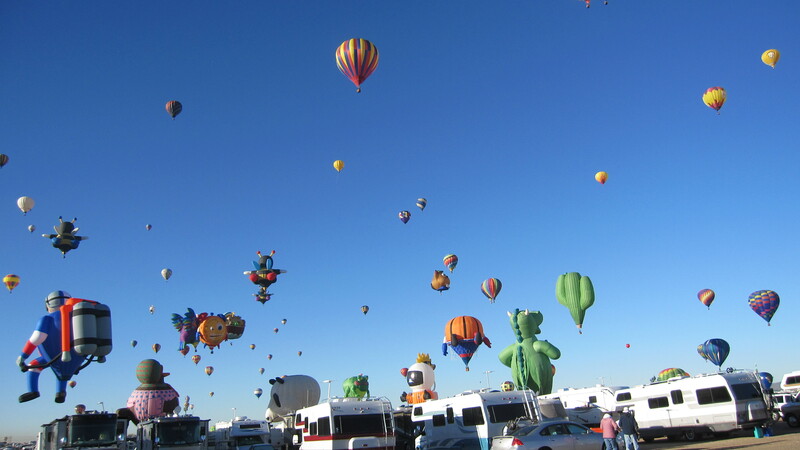 Last year they had all spent a couple of weeks at Sandia Casino and Resort watching the balloons for free! The casino lets RV’ers camp there and it’s on a hill not far from the balloon park, so they could see the balloons from there. After hearing what a great time they had, I made it part of my travel plans. Anyway, I got to the casino late in the afternoon on October 1st, after having my scooter service done in Santa Fe. I wanted to get there well ahead of the Fiesta start date of Oct. 5th, since I had heard the place fills up and wanted to be able to get a spot near my friends. Carol and Christine were already there when I arrived and I was able to get a spot nearby. A security truck was making patrols through the parking lot, registering rigs and passing out a welcome letter. I got my window sticker and info on services at the casino and hotel. They really treat RV’ers well at Sandia. Of course, they rely on a certain percentage of the visitors leaving some of their cash in the casino, so it’s a win-win. Right away I met Pat and Buddy, friends that Carol had made there last year. Super fantastic folks. We all made plans to go to the buffet for lunch the next day. It’s $5 on Wednesdays for seniors (anyone over 50) with a casino player’s card, so I made sure to get my card right away. And what a fantastic buffet they have. Wow! We all loved it. I was able to get the scooter unloaded off of the carrier by myself. Making progress with that. Gravity is my friend, so it’s easier to get it down than loading it up, but my goal is to be able to load and unload by myself. Anyway, we all hung out and visited for a few days, ran errands, etc. I wish I had been able to take a picture of all of the rigs parked at Sandia. There must have been a few hundred. It was PACKED! On Saturday the 5th I woke around 3:00 AM when I started hearing helicopters overhead. I looked out the hatch above my bed, but didn’t see anything. 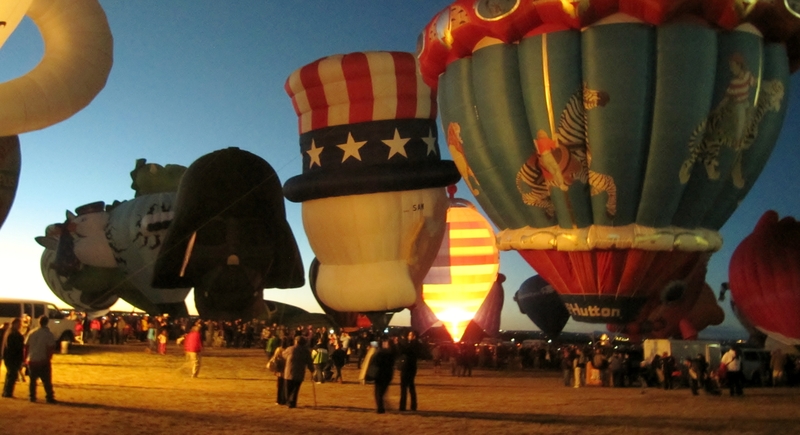 Eventually I got up a little before dawn to see the balloons going up. The helicopters and small planes would fly around every morning during Fiesta. I got used to it and it didn’t wake me up later on. There were so many balloons, I couldn’t believe how many there were. The arroyo (in the photo above) between the golf course and our parking lot was a great spot for playing with the dogs. We weren’t allowed on the golf course, but at about 6:00 PM Christine and I would take Riley and her dog Edna down to the arroyo and let them chase balls and run off some energy. We had a morning walk area on the other side of the parking lot to a natural area were the dogs could sniff and wander. Sandia was a nice area for dogs, and there were lots of other dogs for Riley to meet. He loves making new friends! 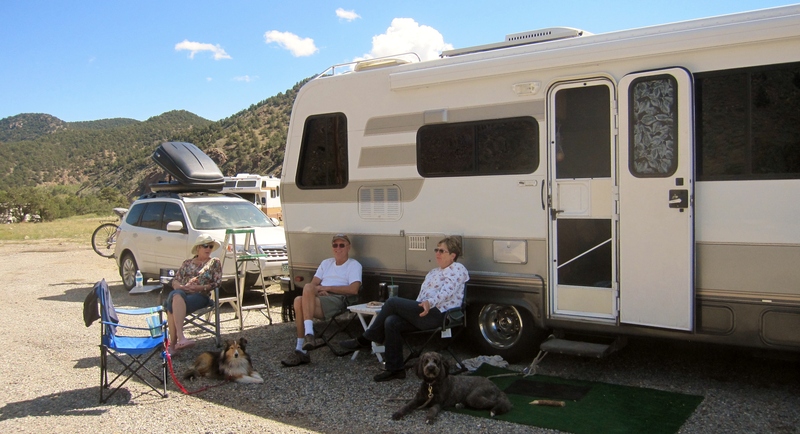 I hadn’t made reservations with the Lazy Daze group, but when we were camped at Abiquiu with John and Linda (organizer for the group at BF), she mentioned there were a couple of unexpected cancellations and might be spaces available if I wanted to come over for a couple of days. 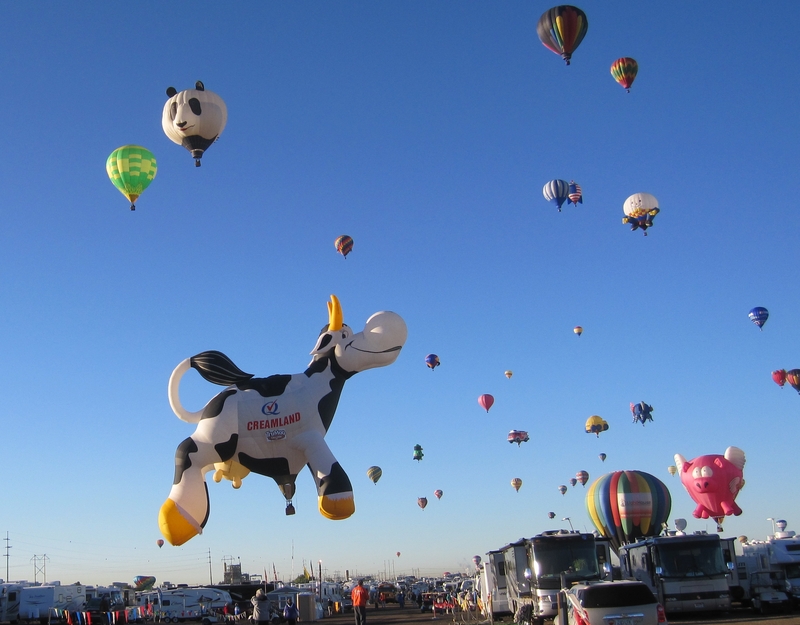 The Lazy Daze group was at the Balloon Fiesta Park RV camping site, down close to where the balloons take off. So, I arranged to move over for Wednesday-Friday. There weren’t any balloons on Thursday morning due to weather. 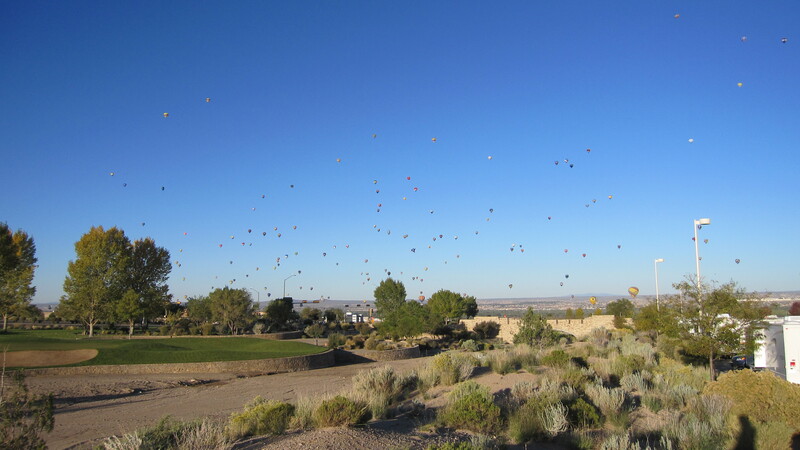 I woke Friday late, about 7AM, and opened the hatch above my bed to see the balloons all over above our site. I quickly got dressed and headed out with my camera. There was something about the weather that morning and the balloons were coming back down very quickly. Especially the large special shape balloons. Some of them were landing very close to us. I ended up staying an extra day, until Saturday. On Friday evening I went with Jimbo, Kathy and her brother to the “Glowdeo”. 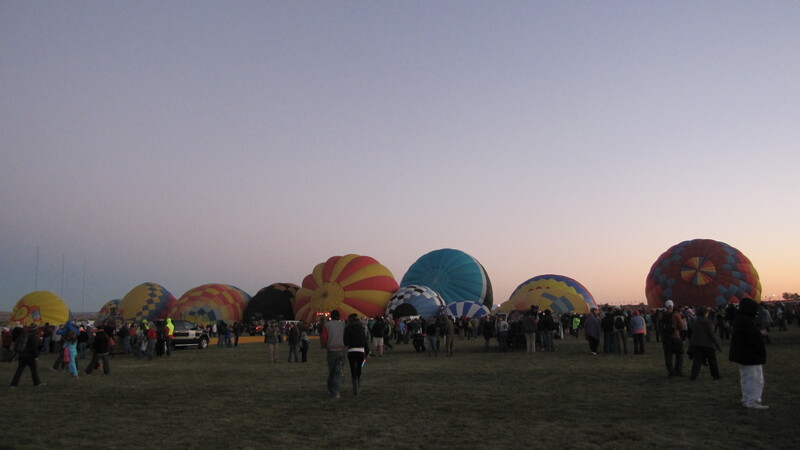 Just after sunset the balloons stay on the ground, the pilots fire up the gas and they light up. Very cool, but it was too dark already to get good pictures. Jimbo got better pictures earlier in the week. On Saturday morning I got up early, early, like 5:00 AM early. 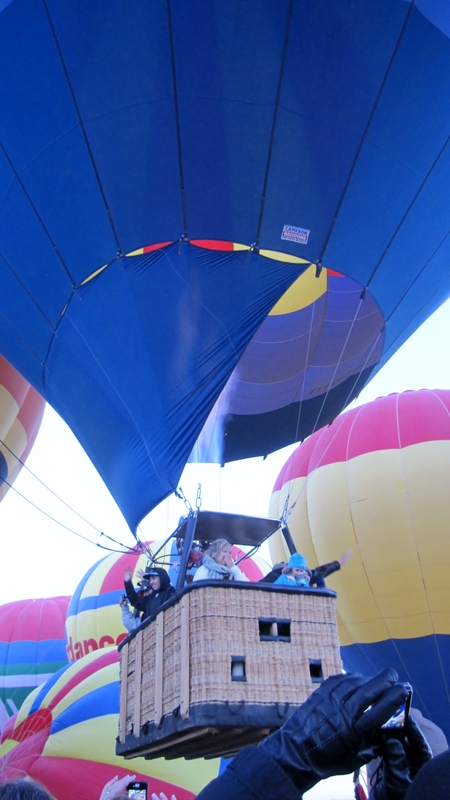 I wanted to go to the field to wander amongst the balloons as they are inflated and take off. What a sight! It was cool being down in the middle of several balloons being filled with hot air, and all the people down there doing the same thing. I could not believe how many people were there. It wasn’t even light yet and there were masses of people. Tons of people had made a real effort to be vertical well before dawn. Amazing. It was nice to be able to walk to the field. The traffic on the way to the park was terrible! Excited riders. It costs a few hundred dollars to ride, but look how happy they are! I also visited the midway, which was huge. Lots of food and stuff for sale, which I didn’t need, but I got an official 2013 Balloon Fiesta pin. Later that day I turtled up and moved back to Sandia, stopping at the Giant Conoco station on Alameda that has a free dump station. Things were winding down at the casino. 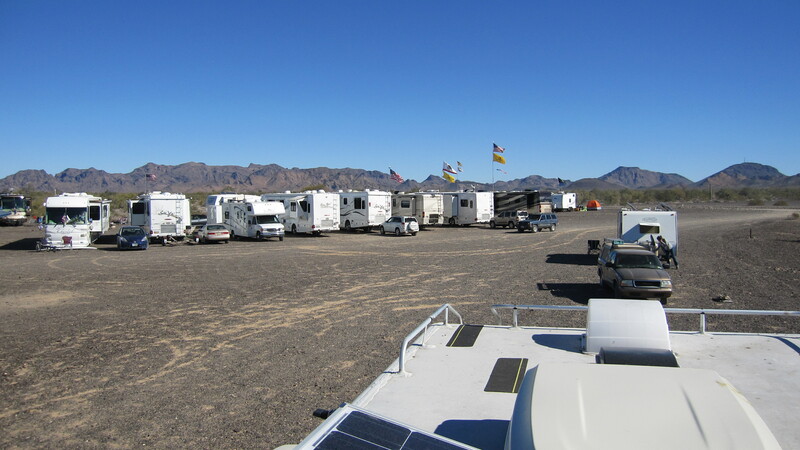 A lot of RVs had headed out already. It was a lot less packed than the prior weekend. All of my friends were still there, but were each leaving within the next few days. I was planning to stay a while more, since I had an appointment on Thursday at an Albuquerque Ford shop, Statkus Engines. I was having an alignment problem and Statkus is known to be a good shop. Over the next few days I got some shopping and errands done (stocked up at Trader Joe’s) and finally did some gambling in the casino. I didn’t hit big, but turned the $25 free-play money they give into $25 in my pocket. 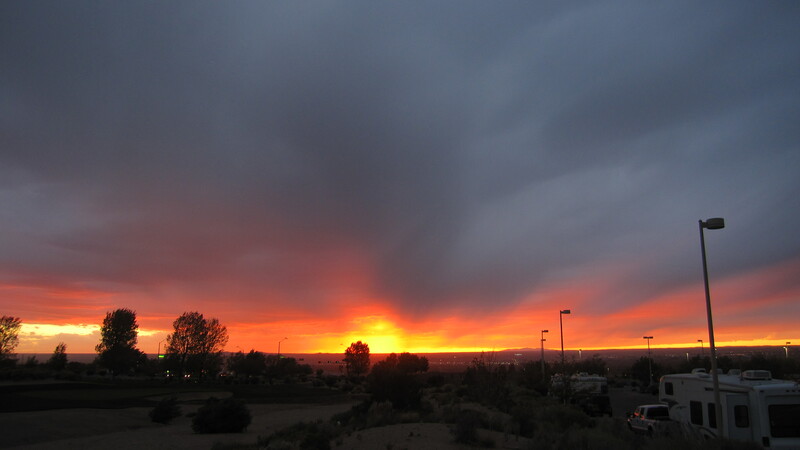 It was super windy one day and that evening we had a weird super-glowy sunset. Like something out of an alien movie. First an update – I’m in Santa Fe, NM for some warranty work on the scooter. It wouldn’t start one day, and rather than drive over to Sportique in Colorado Springs I got an appointment at Centaur Scooters in Santa Fe. 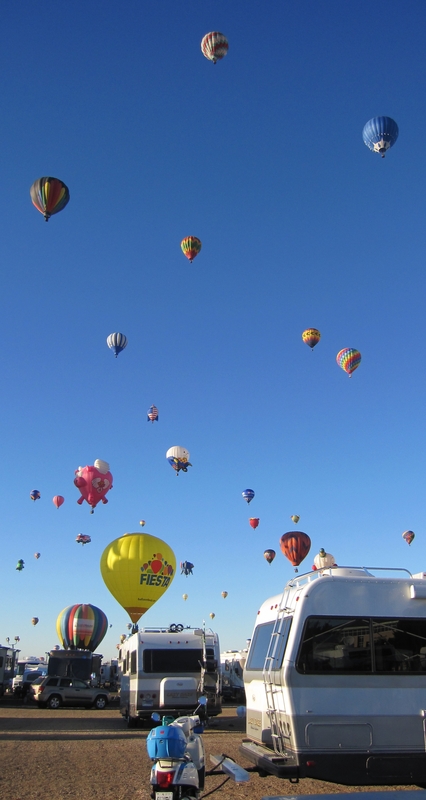 We were already heading to New Mexico to meet some Lazy Daze folks at Abiquiu Reservoir on Sept. 20th, then to Albuquerque for the Balloon Fiesta in Oct. I just had to do a little side trip before getting to Abiquiu. Good news – the problem was a failure by the starter solenoid and was fixed less than 2 hours after I dropped it off yesterday. They diagnosed it quickly and had a solenoid available to use. Also, they filed the warranty claim so I wasn’t out of pocket anything and was able to load up the scooter and be on my way. Sometimes you get an early failure on a part, so I’m not worried about the scooter. I really liked Centaur when Chris and I visited in June. We had stopped in there to look at scooters and see about putting a rack on my prior rig (which ended up not being possible). It seemed like a great mom and pop shop, well stocked and well run. They sure did well to get me on my way with no delay. So, I have scheduled my initial 200 mile service with them, before heading down to Albuquerque on Oct. 1st. 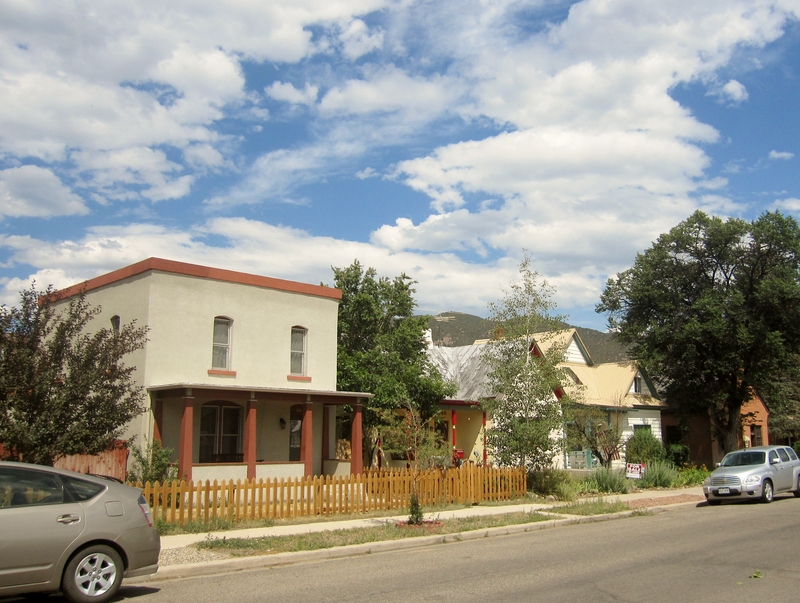 Anyway, after Leadville we moved down to Salida. We had stopped in there for a week or so back in late June, early July. 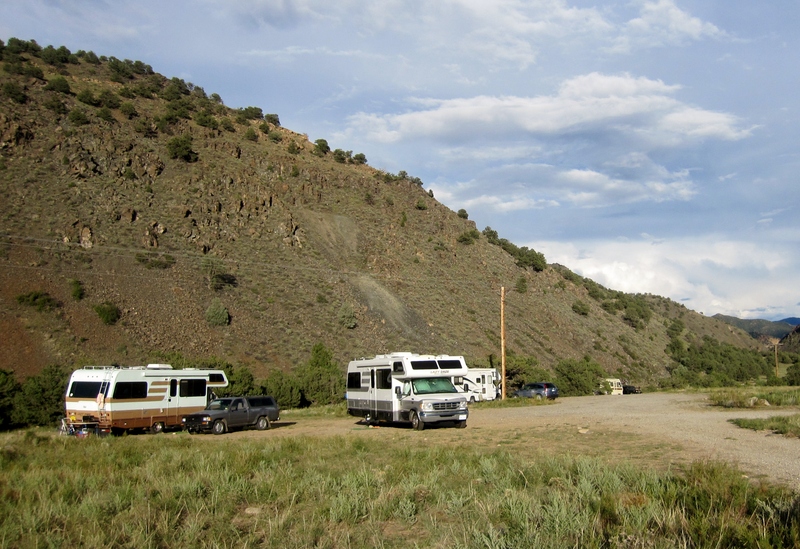 There is a free BLM boondocking spot just east of town, on the Arkansas River. 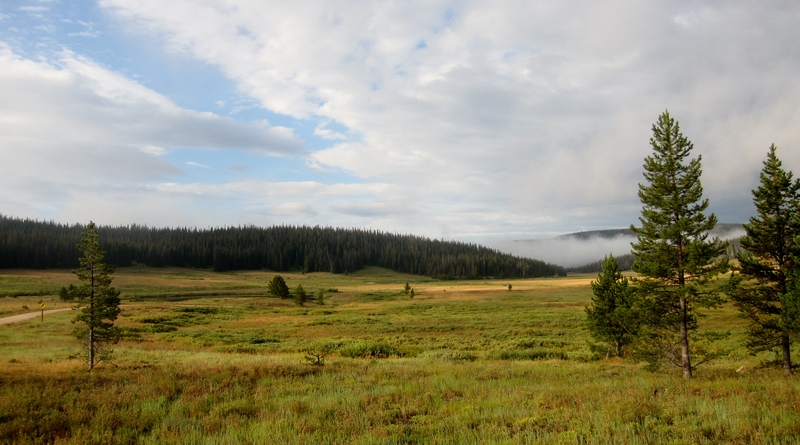 Leadville was nice and cool (highs were in the high 60’s, low 70’s), but really cloudy and rainy. My 85 watt solar panel couldn’t keep my batteries charged with just an hour or so of sunshine per day. So, Salida seemed like a good next stop, usually sunny, hopefully not too warm at 7,000 feet, plus we had enjoyed it before. 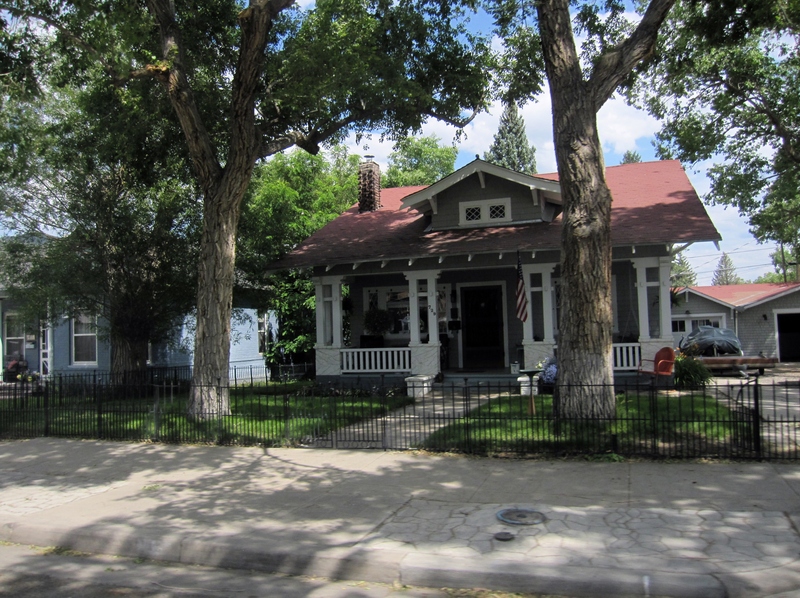 Salida has a Walmart, dump station/water at the Chamber of Commerce and a decent laundromat. I utilized all of them on the way to the campsite, that way I would be set and not need to move for 10 days. 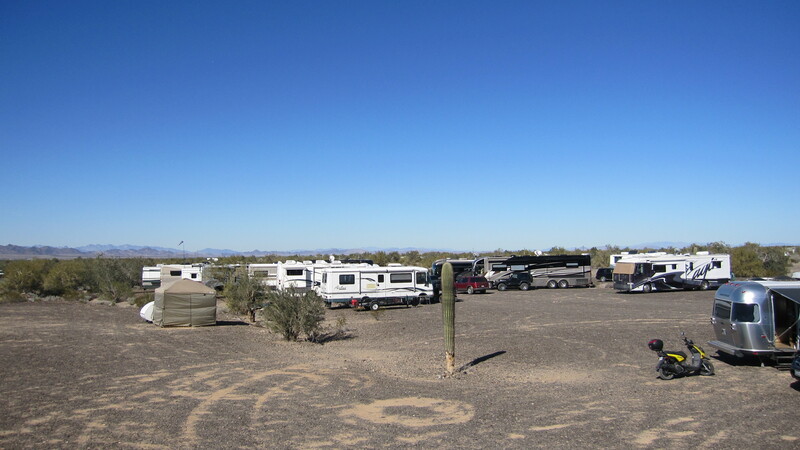 Salida Campsite. The Arkansas River is right behind our rigs. 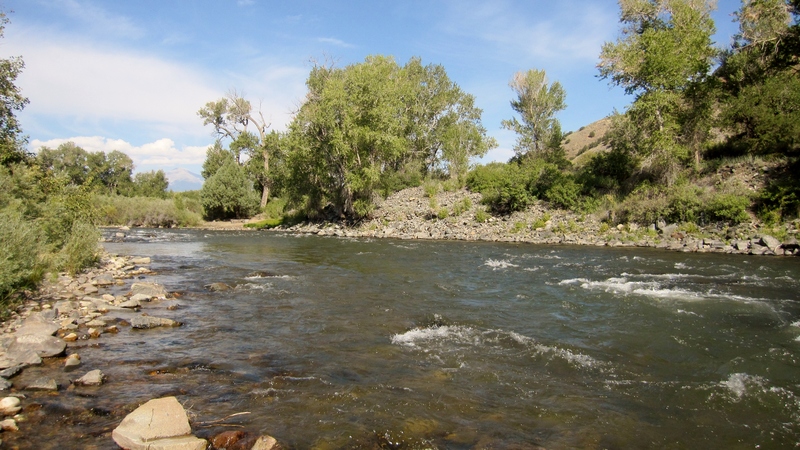 Chris had fun fly-fishing in the Arkansas River near our site. Chris and I unloaded the scooter that afternoon. 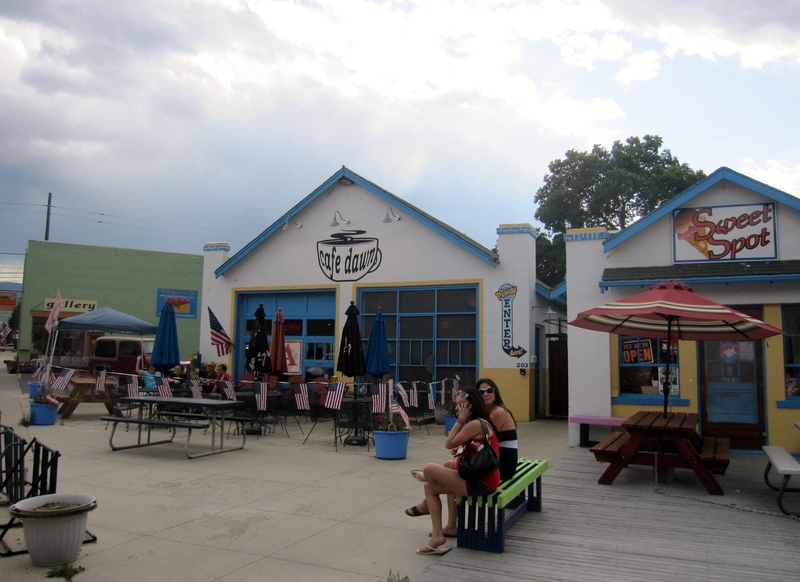 I was really excited to have it at this spot, since the town is cool (cute with a funky vibe) and just a couple of miles away. The next day (9/6) I made a quick trip in to get something at the True Value hardware store. The next morning was Saturday and I was looking forward to scooting to the Farmer’s Market and the big Fiber Fest (yarn and roving, spinning and weaving, etc.) in Riverside Park. Unfortunately, the scooter wouldn’t start even though it ran fine the day before. Everything worked except the starter button. We checked the battery, fuses, whatever else we could see, but couldn’t find the problem. I was quite bummed. Next on my failure tour, the batteries didn’t seem to be holding a charge, even though we had more sunny days in Salida. Checking the cells with a hydrometer showed the batteries were only 50% charged. I called my Dad and also my friend CB for advice. They are both smart engineers and had good info, things to check/do. Also, I spoke to AM Solar, the servicer for my solar controller. I decided to check into the RV park next door and plug in for a day or 2 and get up to 100%. After 2 days one battery was up to 75% and one was still barely above 50%. There must be something wrong with them. I had just gotten them at the end of August in Steamboat Springs, so I swung by Napa after leaving the RV park and explained the situation. They had to order a set that would arrive the next morning as they didn’t keep the 6 volts in stock. I asked them to put a slow charge on them and I would come by in the afternoon when ready (something I should have thought to do with the Steamboat Napa). I picked them up Friday, the 13th, and this set seems to be doing fine. While at the Salida spot Chris and I took the opportunity to wash and wax our rigs. It takes a while using just buckets of water. The wax didn’t seem to do well on the silver/grey paint on the part I waxed, leaving swirly streaks where I applied it. Figures, everything that could go wrong was going wrong lately. Now I had ruined part of my paint. Terrific. I read online that 3M makes a restorer for heavily oxidized paints and was able to pick some up at Napa. Haven’t had a chance to try it yet. Hopefully it will work OK to restore the silver. Chris’ rig looks really good all washed and waxed, though. 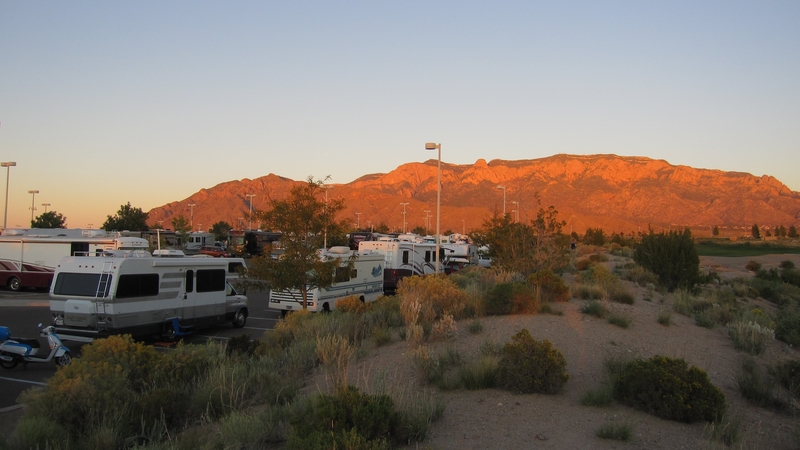 When I got back to the campsite after leaving the RV park I found that my friend Carol, who I had met in Caballo Lake last year, was camping near us. I didn’t remember that she was from the Salida area. 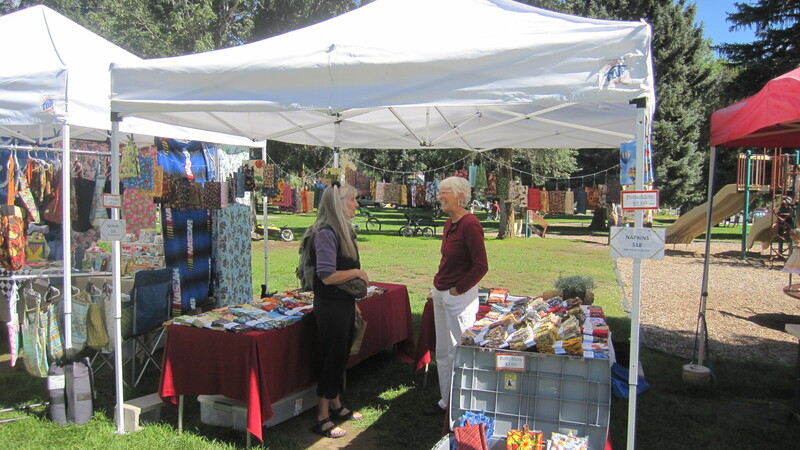 She makes really beautiful sets of cloth napkins and potholders and had a booth at the farmer’s markets at Salida. I drove in to town on Saturday to do the market and run errands. It had been raining for a few days and more was forecast, but it turned out to be a really nice morning, great for the vendors. I hoped to get some cranberry/almond/cinnamon swirl bread at the baker’s booth. I had gotten some in July and had lusted for more ever since. Luckily they had some and I’ve been enjoying it for breakfast. 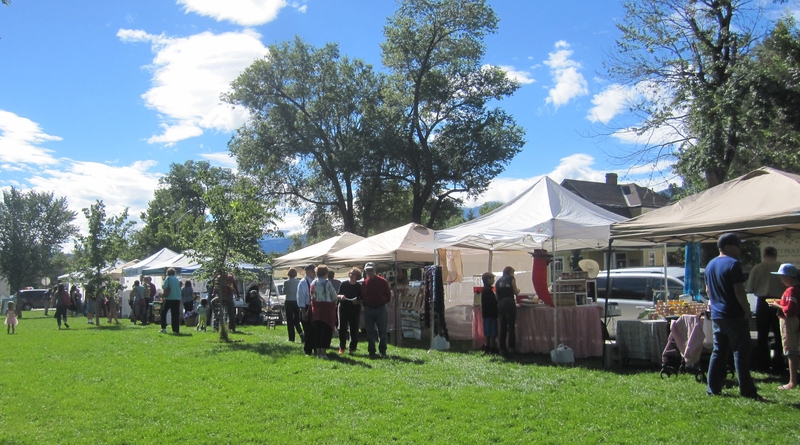 If you ever get to the Salida farmer’s market look for it, it’s fantastic. Carol (on the right) at the Farmer’s Market with her beautiful napkins and potholders. Salida’s a town that I could live in, but it’s been ‘discovered’ and real estate seems to be pretty expensive. Well, it’s a nice place to visit for now. 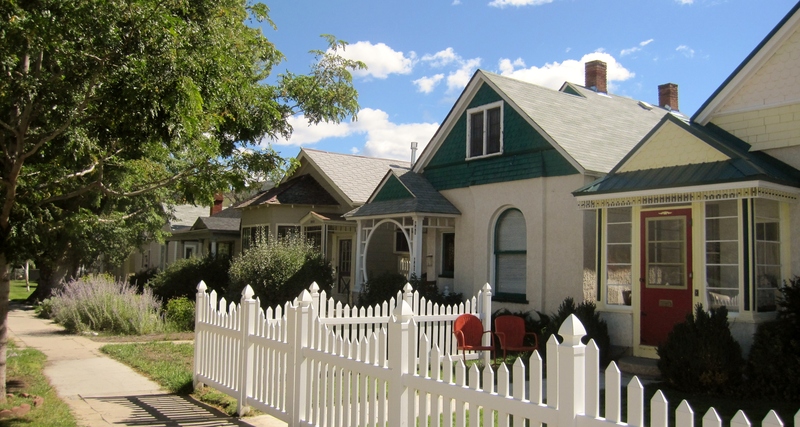 The little house in the middle with the for sale sign was about $300k! Just before leaving we had more Lazy Dazers roll in. 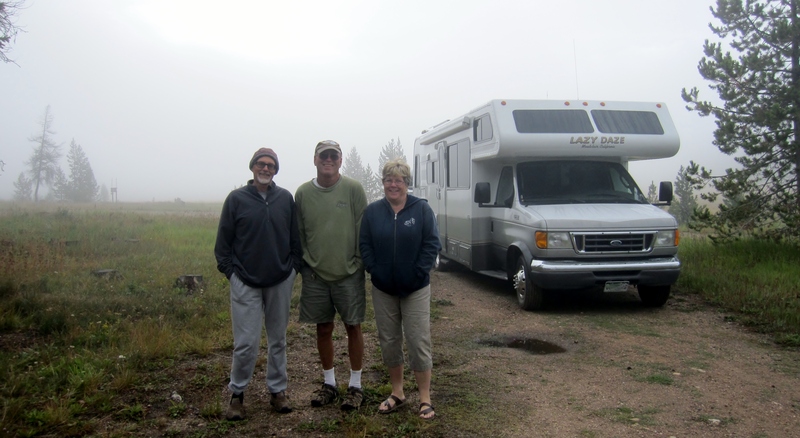 John and Linda (and Sadie), who stopped to see us at Rabbit Ears Pass, stopped by on the way to Abiquiu from their home in Colorado Springs. 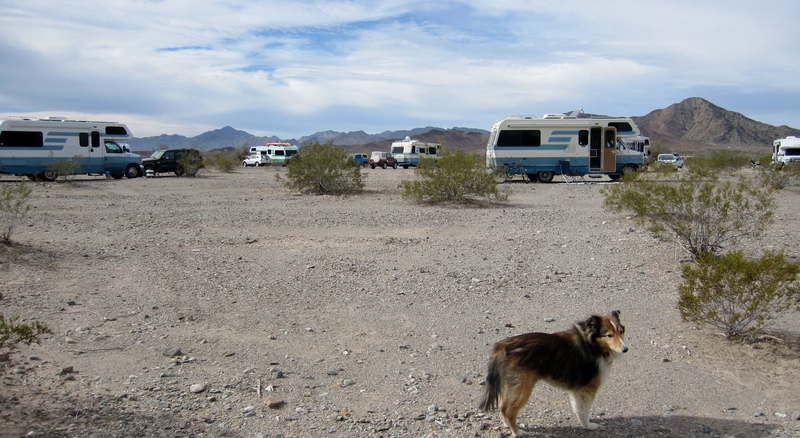 Also, Frank and Cookie, who I had briefly met in Quartzsite, were traveling with them, so we had 4 Lazy Dazes at the campsite for the night. It was great to have a visit with them, and we all went out to Amica’s Pizza for dinner. Great pizza and company, a terrific evening. Can’t wait to spend time with them and a whole bunch of Lazy Dazers in Abiquiu over the next several days. After Denver we went west on I-70 to pick up Hwy 40 past Idaho Springs and head north. It’s a pretty steady climb to Idaho Springs, and then Hwy 40 zig-zags up to Berthoud Pass at 11,307 ft. elevation. That’s a tough climb. 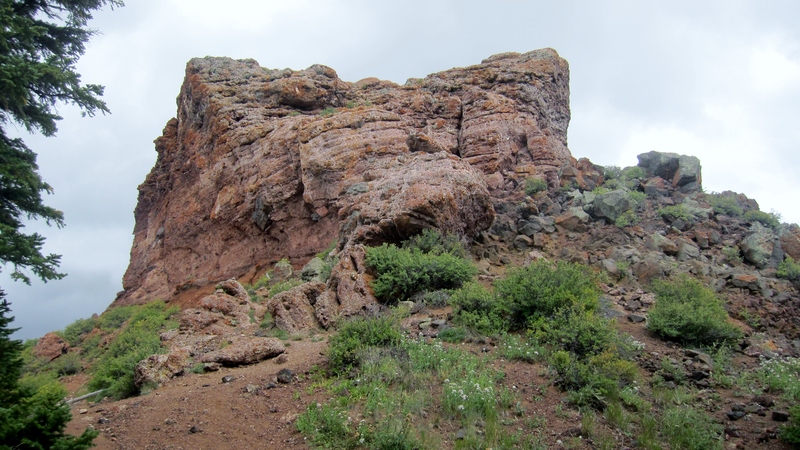 We were heading to Hot Sulphur Springs where we would meet Chris at the city’s Pioneer Park. 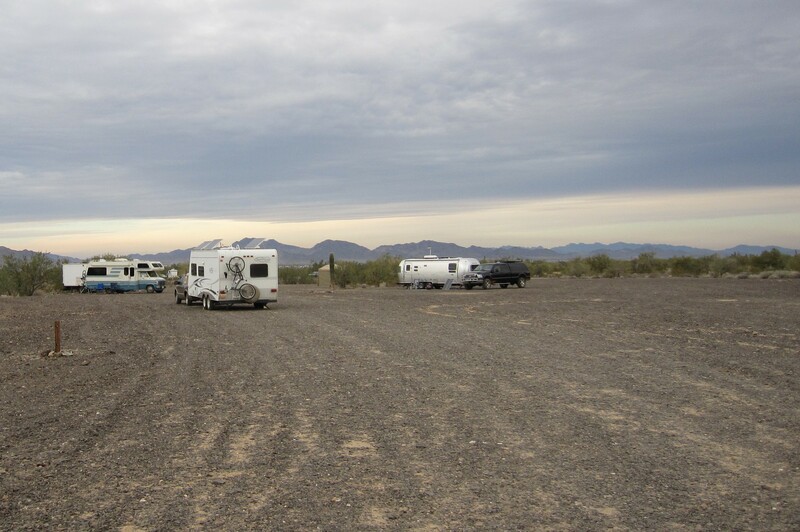 They have campsites in the park, right on the Colorado River. 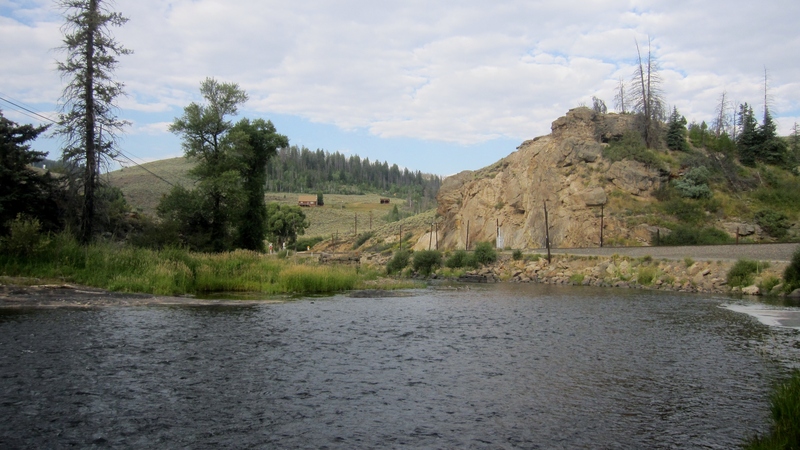 We spent 2 days there and Chris had a good time fly-fishing right near our site. It was a great spot, except for the train tracks next door. Lots of trains, lots of train horns, including overnight. Other than that it was a nice little spot. Tiny little town, nice to walk around it in the evening. 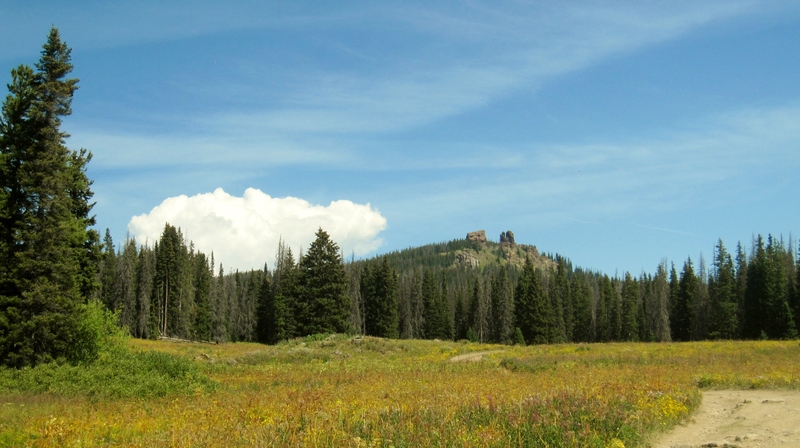 Next we were going to a spot that Chris had heard of called Rabbit Ears Pass. It’s on Hwy 40 on the way to Steamboat Springs. I checked the Escapees Days End directory and saw a few listings for the pass area. 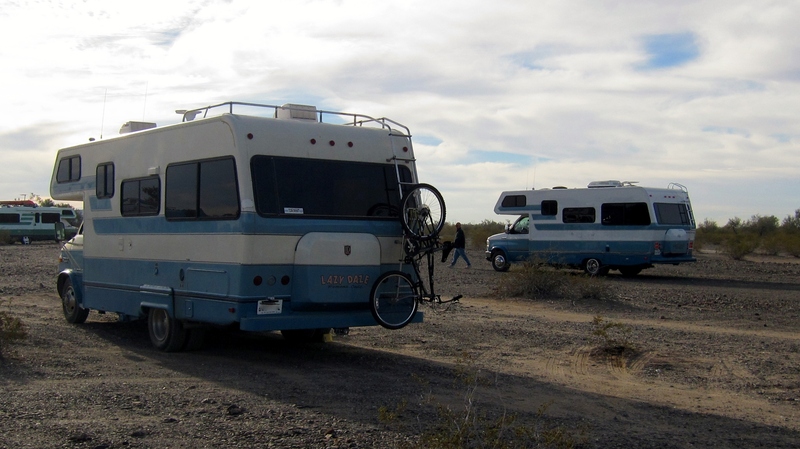 Looking at Google Maps, there seemed to be a couple of good boondocking spots right at the top of the pass. We pulled in and really liked the site. We were back in the forest, yay! 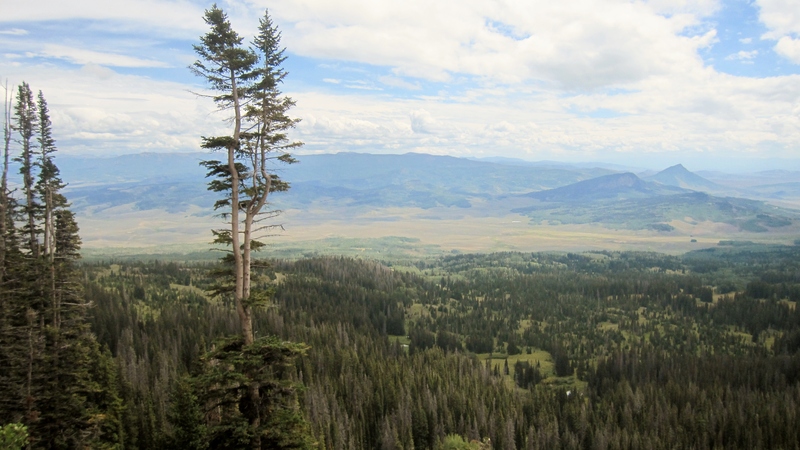 It’s at about 9,700 feet elevation, so the weather was very nice and cool. 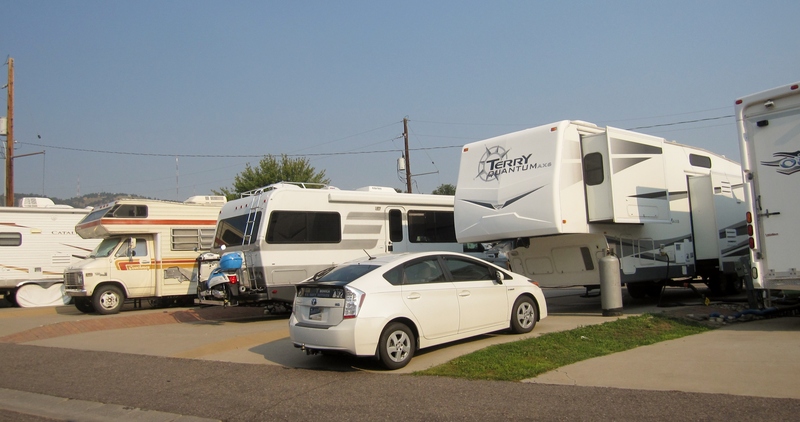 By the way, while in Golden we were packed in like Sardines at the Golden Terrace RV “Resort”. But, my neighbors were all just great, and the other residents I met at the dog run were really nice. Again, glad to have a site for a month for $500, no complaints, but it was good to be back in the forest with no one around. Neighbors (L-R) Jerry, Jay, Jim and Carol were all super nice. 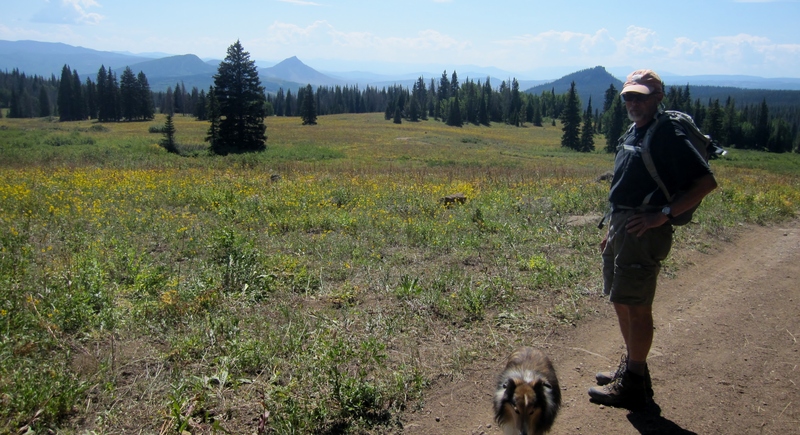 There was a trail-head just across the highway from our site and it took us to the Rabbit Ears Trail, which we hiked part way. Then, on another day, we drove to the trail-head and hiked the full trail. It gets pretty steep near the top. The views up there were great! One of the rabbit ‘ears’ up close. 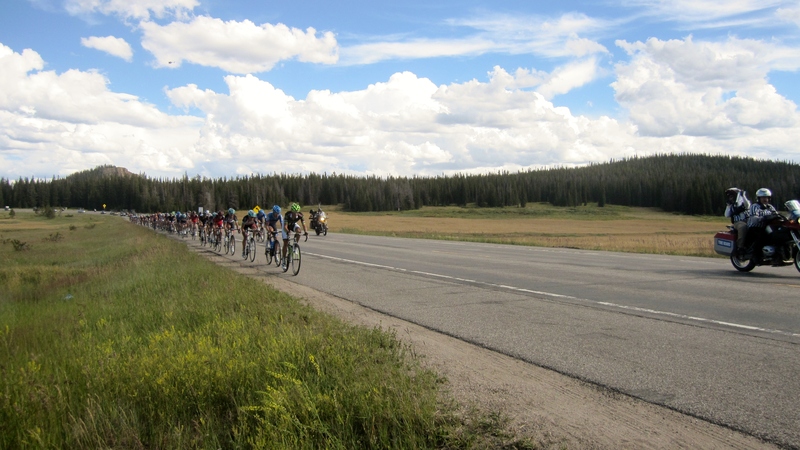 While we were at Rabbit Ears the USA Pro Challenge cycling race came through. 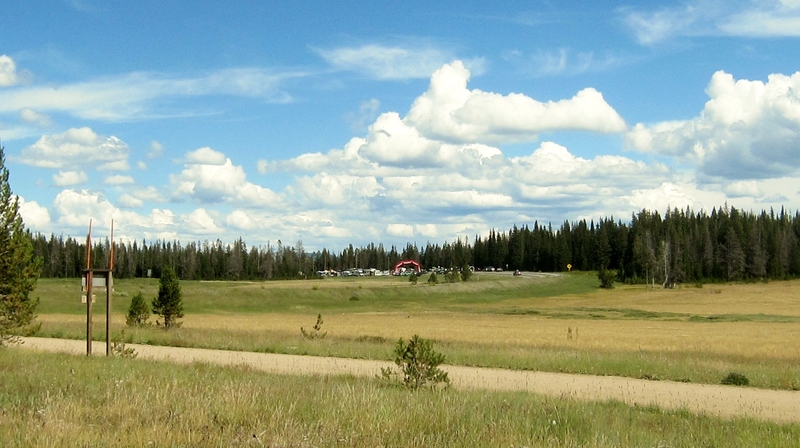 Rabbit Ears Pass was a ‘King of the Mountain’ site for the riders to earn points. We could see it from our site, but we took our chairs out by the road and sat with another couple that had parked there to watch the race. 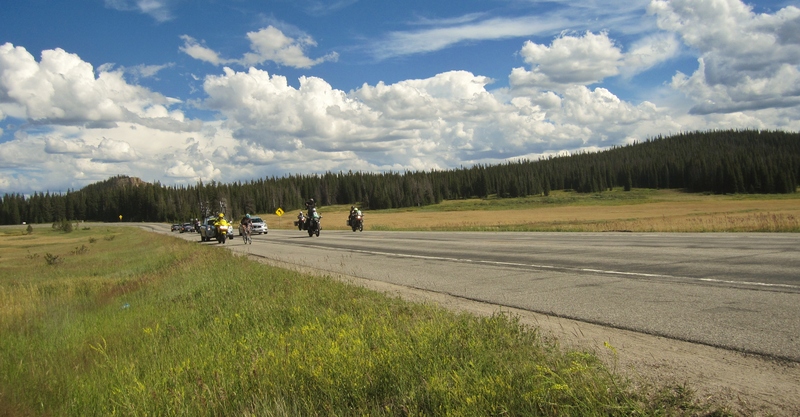 It was a great viewing site as the riders came over the hill and started the descent into Steamboat Springs. Jens Voigt had built up a major lead up the mountain and he was first past us. He would later lose the lead as the Peleton caught up to him within a mile or 2 of the end of the stage. Here comes the leader, Jens Voigt. Plus the camera person, and lots of support vehicles. Later the Peleton went whizzing by. It was really cool to be so close to the action of the race. I had never seen a bike race in person. The number of support vehicles that precede and follow the race was phenomenal. The couple we watched with (they were from Florida) followed cycling and were able to tell us who was who and what was what during the race. It was nice sitting with folks who could answer our newbie questions. One day we had a visit from our friends John and Linda. 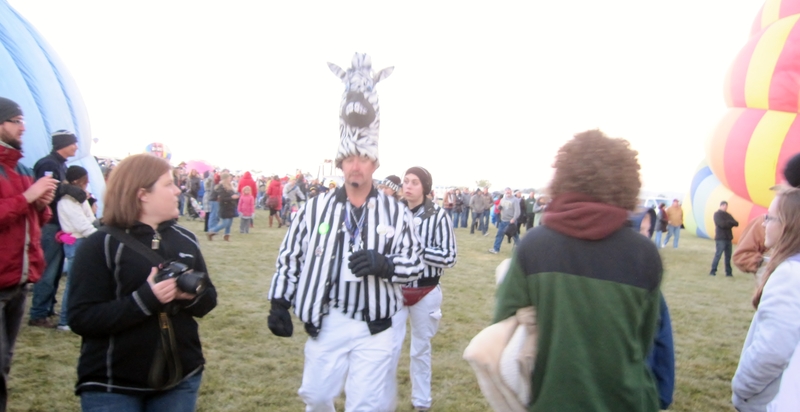 We had met them at the Lazy Daze gathering in Quartzsite in January. They were on their way back to Colorado Springs from a trip to Grand Tetons National Park. Their route back home took them pretty close to us so they swung by and spent a night at our spot. It was so good to visit with them again. The day they came I was working on changing out my house batteries, which were about 6 years old and not really holding a charge anymore. So, Chris and John took them out and I drove Chris’ truck to the Napa in Steamboat Springs for a couple of new 6 volt golf cart batteries. Then the guys hooked them up. Linda took a picture in the middle of it and she posted it on her blog, Adventures with Sadie. Our visiting got cut short by rain in the evening, and the next morning it was very foggy when they were about to leave. But, I still got a pic before they took off. 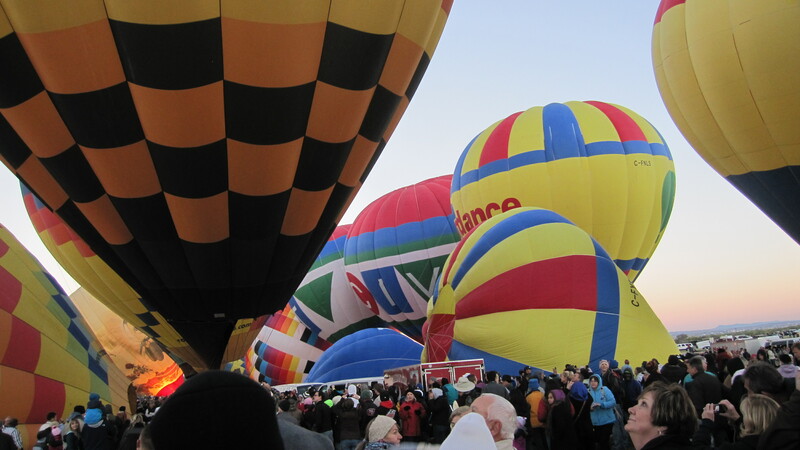 Looking forward to visiting with them again in Abiquiu, NM later this month, and at the Balloon Fiesta in Albuquerque in October. 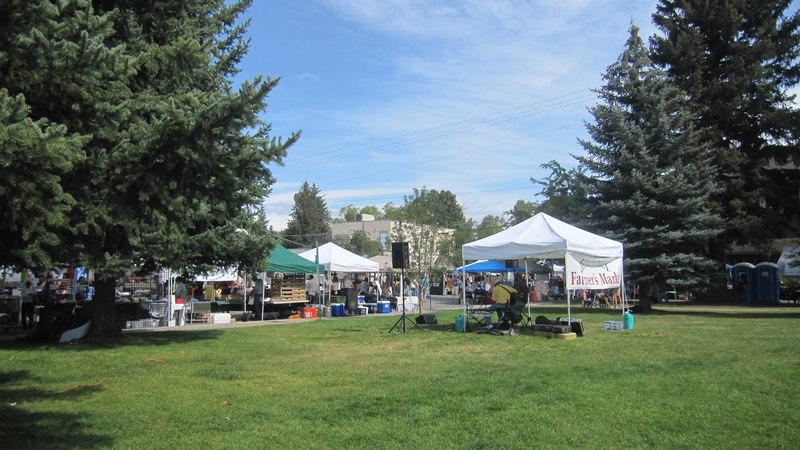 The next morning was Saturday, so we went in to Steamboat Springs to go to the Farmer’s Market and stroll the town. It’s a really pretty town. They must have strict ordinances about buildings, even the McDonald’s looked like a ski chalet. 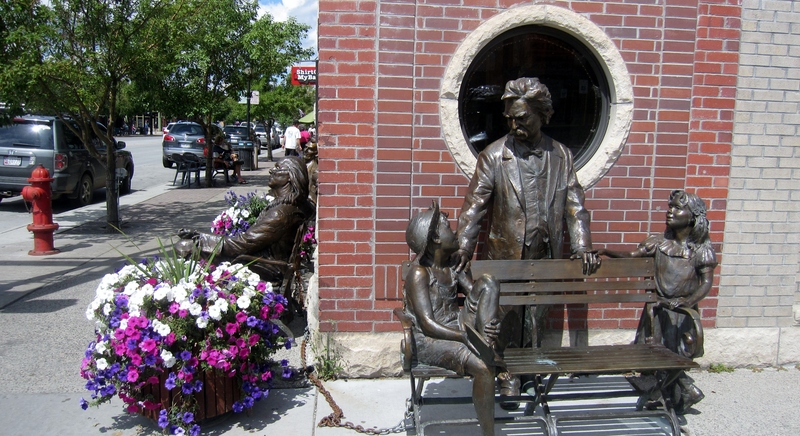 There were some very nice statues around town. I liked the ones of Abe Lincoln, Benjamin Franklin and Mark Twain. at the benches on one corner. 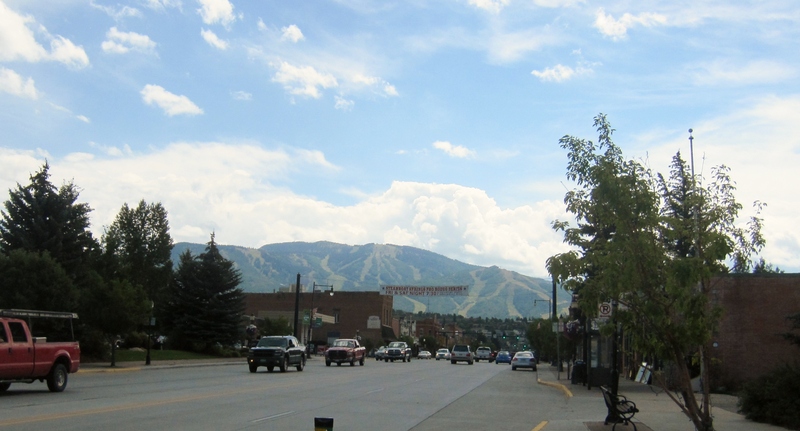 View down the main street, toward the ski mountain. 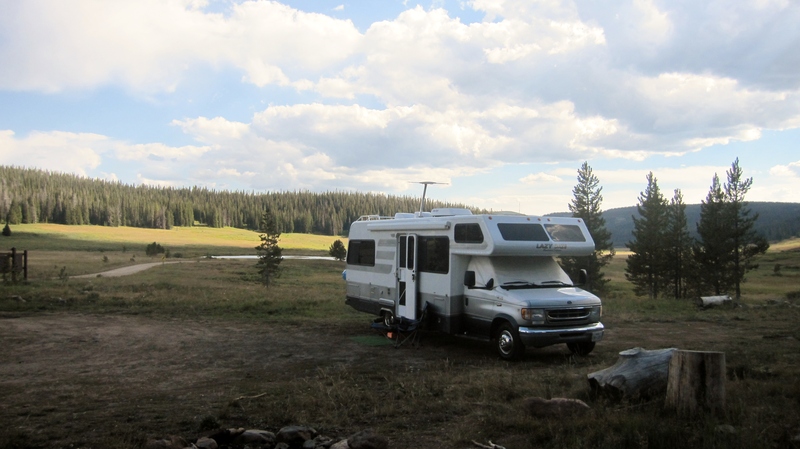 While camped at Hot Sulphur Springs and Rabbit Ears Pass I/we did some work on the rig. We (97% Chris) changed my water pump, which was starting to fail. I hung an IKEA LED light above my back window like I did in my prior RV, and another of the same light above my dinette (I love that light fixture.) I put in a gooseneck faucet in the kitchen, same fixture as my dad and I put in the last rig. Mostly I was able to do it myself with Chris supervising and checking my work. Next we wanted to go to Leadville. 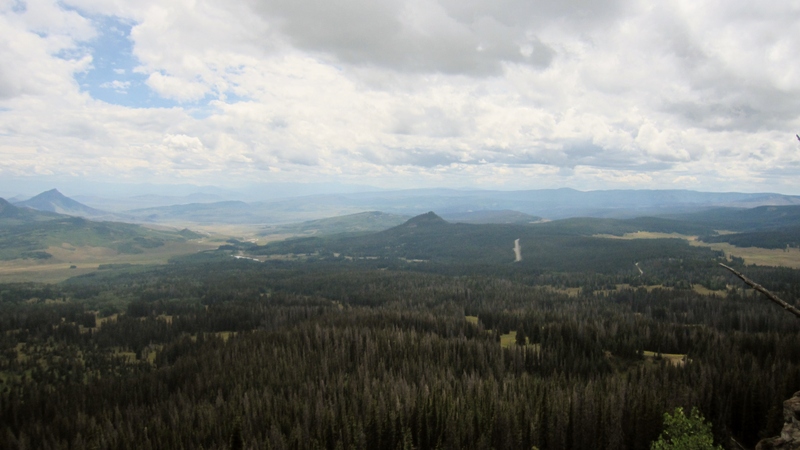 I had found a couple of possible forest sites west and southwest of town and, at 10,000 feet elevation, should be cool enough. On the way we stopped at Wolford Campground near Kremmling. I needed to get a full charge on my new batteries (my 85 watt solar panel wasn’t cutting it) and needed a plug in site. 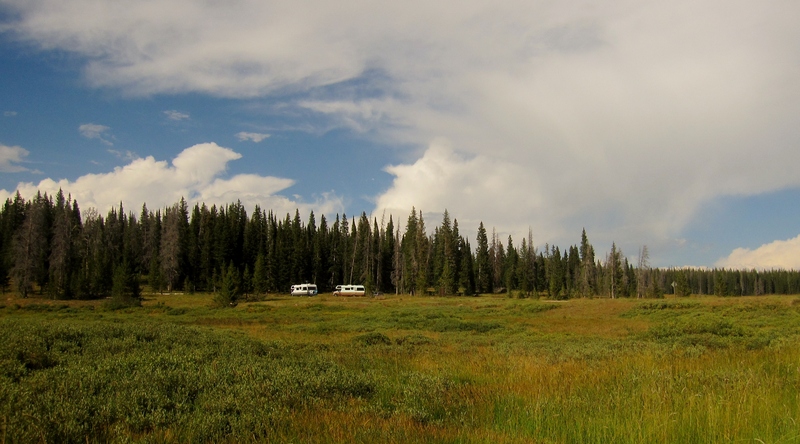 The Wolford site was better than a cramped RV park. Chris did a little fishing in the lake, but he prefers fly fishing in rivers. 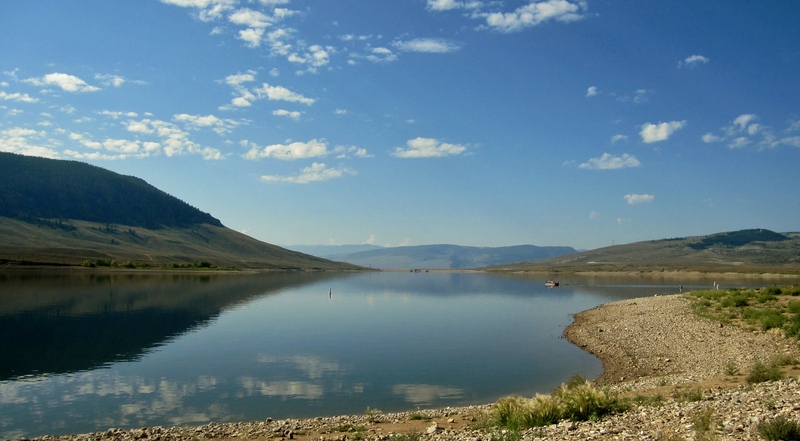 Wolford Reservoir. Chris is there – a dot along the shore towards the right side. 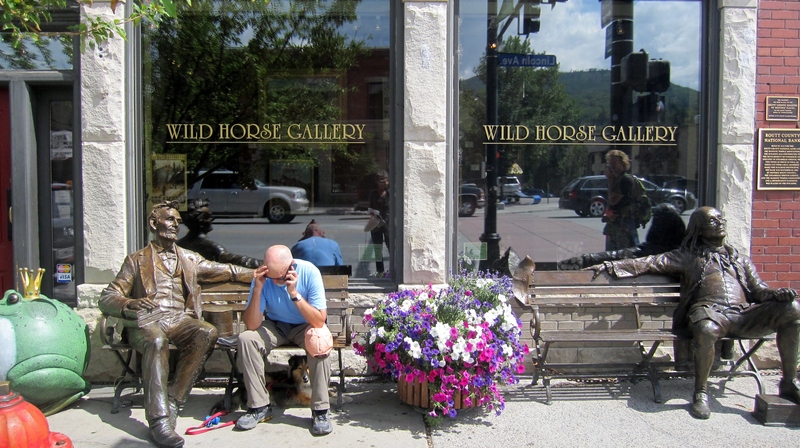 Will write about our visit to Leadville next. Is this a perfect site or what? Riley and I are still having a good time in Quartzsite, AZ. The RTR (Rubber Tramp Rendezvous) had lots of good seminars and fellowship. For the first week or so it was just us and we were pretty spread out. 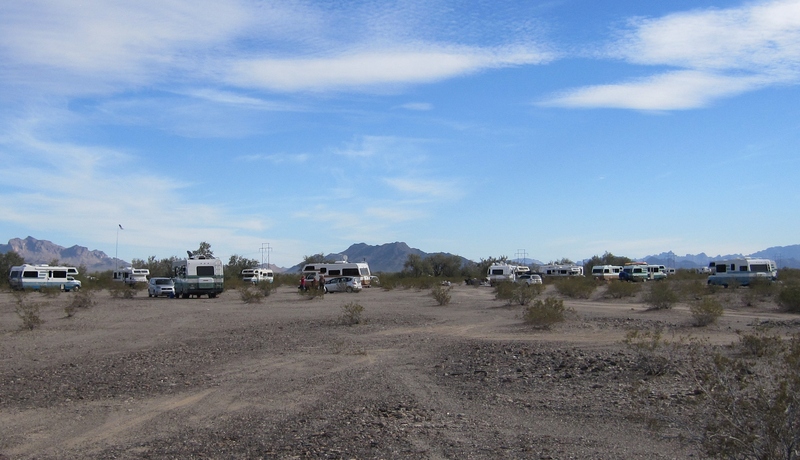 As it got closer to the big tent show (Jan. 19-27) a lot of big Class A RV’s pulled in near us and parked side by side like sardines. And wow, do they like to run their generators. It was pretty loud, but we still enjoyed our spot. I got to do some shopping at the vendor area. They are geared to RV owners, so I got things like vent covers, LED lights, tools, etc. Then, when the big tent show started, I got to ride over with CB and and his friends that were visiting from L.A. It was HUGE, but was mostly just one big infomercial. Lots of handy-dandy products for sale, and lots and lots of people. It was packed. I did splurge on a 6’x9′ mat for outside my door. At the RTR I got to meet lots of neat folks like Kim, Ryan, Susan, Dori, Sandy, Joyce, Brad, and of course Bob, the organizer. I can see why many folks go back to the RTR every year. Good times with great people. 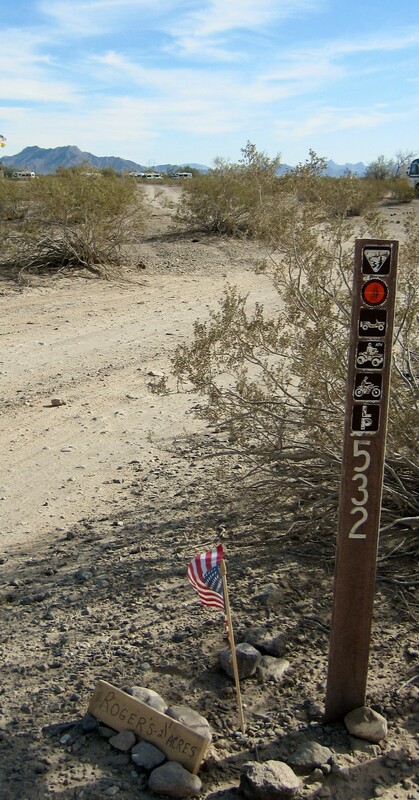 The BLM area is a network of dirt roads, but well marked. Roger has his sign here, too. On Thursday the 24th I went with Roger, Linda and Jim to the big tent RV Show. I wanted to get some more LED lights and a new fixture for my couch area. The place was quite packed again, but I did get the fixture I wanted. (Later I realized it wouldn’t fit and will have to exchange it when I get to Yuma.) On Friday Jim was heading to Walmart in Parker and I got to ride along. Jim has been a full-timer for 2.5 years and just a couple of weeks ago found a great vehicle here to tow. Now Jim is the one providing rides to folks like me! I hadn’t been to a proper grocery store since Casa Grande, so I was ready for a Walmart run. Riley and I have kept up our daily walks. I really enjoyed walking with folks at the RTR and have transferred that to an 8:30 a.m walk at the Lazy Daze camp. Chris and I have been walking every morning and Linda and Jim have joined occasionally. 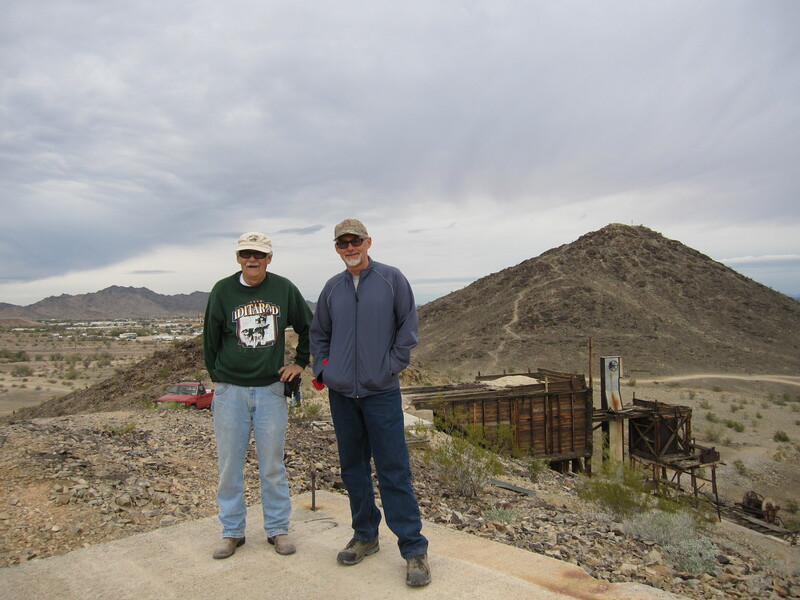 On our first walk Jim, Chris and I hiked up a hill with an old abandoned mine on top. While here I have been able to do some work on my rig. Although the LED fixture I got at the RV show won’t work, I have an IKEA fixture that I got from CB. It’s a strip light that I wanted to hang under my back cabinet, above the table. John and Roger explained how to take up the cabinet shelf to get to the space above the cabinet bottom. (There is a bit of ‘subfloor’ in there where wiring runs.) Then, when I had it up, John came over and drilled a hole for the wire to go through. He wired it to an existing switch that was originally for a fan that was replaced later with stereo speakers. Now I have a great light in my main area that draws almost no electricity from my batteries at night. Since I have solar and can boondock for extended periods, power usage needs to be as efficient as possible. John also helped fix my step light and the trickle charger for my cab battery. It’s so nice camping with Lazy Daze folks that know how all the systems work and can help those of us that need it. When I first arrived I parked next to a new blue/white TK floorplan. It looks almost exactly the same, although 20 years difference. The newer paint jobs are a bit swirly, but this owner paid extra for the classic look paint scheme. My 1992 Twin-King on the left and same floorplan 2012 rig on the right. The Lazy Daze group is a fantastic bunch of people. In the evenings we have a happy hour at 4:00, and then Roger starts a campfire about 5 or 6. We sit and chat until about 7:00 or so when folks break up to go make dinner or just in for the night. We have had a few cookouts, too. Roger has a great grill. He made a Tri-tip last night and everyone brought a dish or desert. We also had a hot dog cookout on Sunday. Tomorrow we are going to have a big breakfast, Roger on the grill. 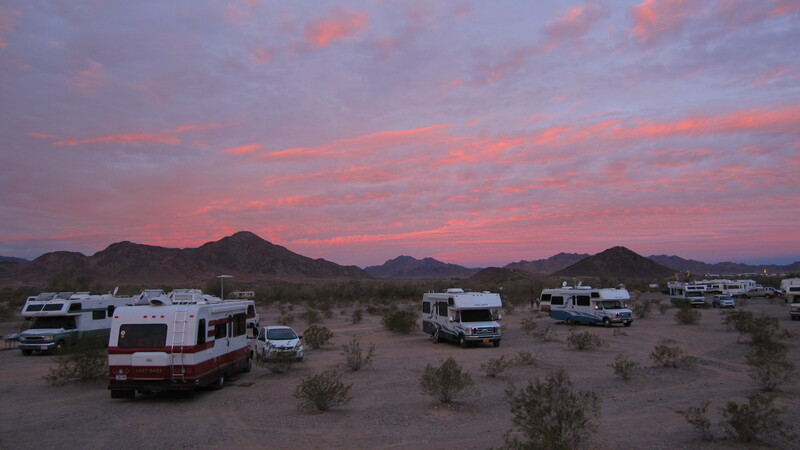 That’s all for now, but I’ll leave you with a beautiful Arizona sunset over our Lazy Daze camp. I got back to my folks place on Lake Buchanan on November 17th, and had about 7 weeks to get a bunch of stuff done before heading out the next trip. 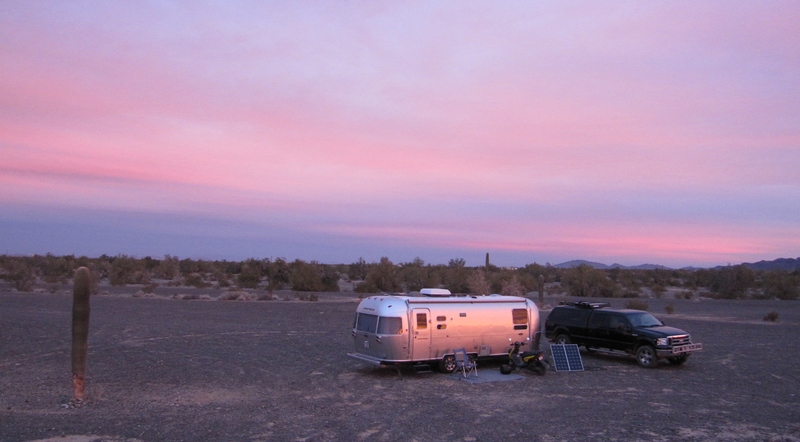 The biggest things were to do some improvements on my RV (like adding solar) and to get rid of the stuff I had kept after selling my house. 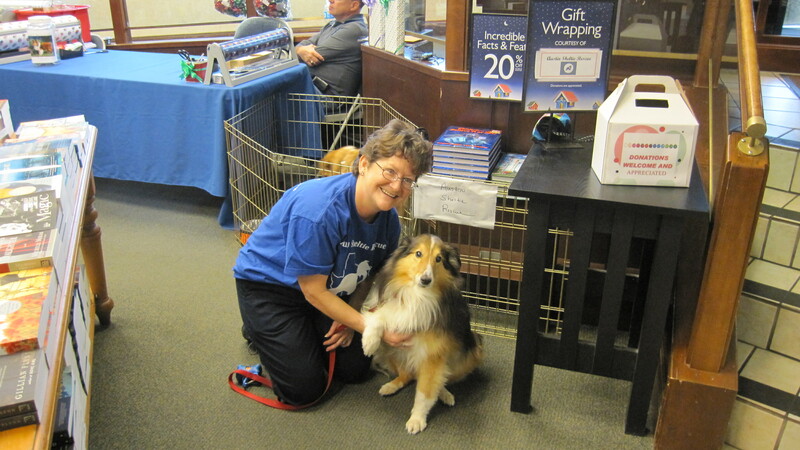 Also, I wanted to volunteer with Austin Sheltie Rescue and see my friends. And, of course I wanted to spend time with my family. First, I needed to figure out the equipment needed for the solar and get it ordered. My dad is an Electrical Engineer, but had not worked with solar systems before. 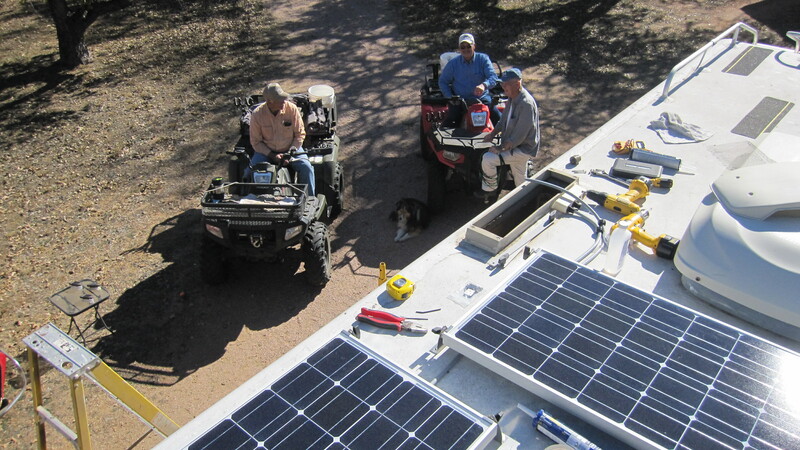 I had some websites saved from my research (like solarrvpanels.com) that we looked at, and my dad figured out what equipment we needed and how to put it together. [ For RVers looking to do solar – the system we decided on includes: 2 100 Watt panels from AM Solar (includes mounting hardware and wiring harness), 2 tilt bars from AM Solar, Blue Sky 2000E Charge Controller (MPPT type) from Infinigi, Trimetric 2025 Battery Monitor from Infinigi, Xantrex Prowatt 2000 watt inverter from Marine Parts Source, and various wires, mounting boxes, fuses, shunt, etc. ] Also, we removed the non-working Onan generator and added 2 additional 6-volt batteries from Interstate Batteries in Marble Falls in that compartment. We also spent time replacing the drippy kitchen faucet, and adding a new TV antenna, which was problematic due to an apparent break in the cable wire which runs from the roof antenna to the wall socket. We had to run a new coaxial line from the roof, behind the microwave and through the compartment above the couch. Not fun. Dad also rewired my backup camera. And we put in 2 new outlets in front and back to work off of the inverter. 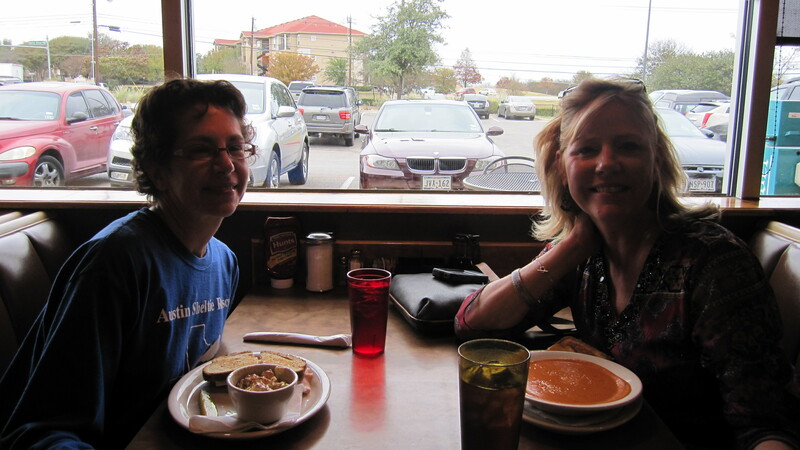 While in Austin I got to have lunch after the gift wrapping with some friends. First was with Lori, who is with Dun & Bradstreet and is the Account Executive for the Dell account. We always enjoyed working together, and I was so glad to be able to meet her for lunch and catch up. 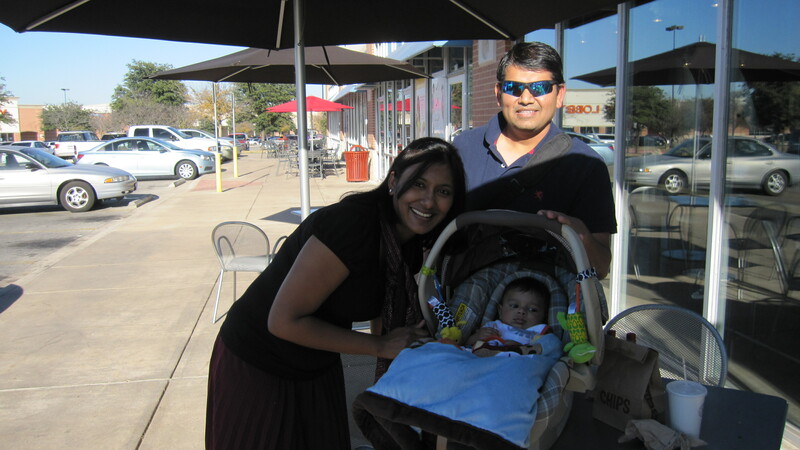 On another day I got to have lunch at Chipolte with Sanjukta. We worked together in Marketing, in my last year with Dell. I also got to meet her husband and new baby. I had lunch with friend and former co-worker Lynne at Chuy’s (I LOVE Chuy’s) but forgot to take a picture. Darn it!! After wrapping with the Shelties, and lunch with friends, I would go to the storage space and pick up as many boxes and stuff as would fit in my car and take back to the house. I’d sort the stuff out on tables to figure out what to do with it all. For the furniture, I didn’t really want to post for sale on Craigslist and then be running in to Austin every other day, so arranged to have Next to New come pick it up and put it all on consignment. And I made a few trips to goodwill. Eventually I got it down to a small stack in the garage and a few boxes in the spare bedroom closet inside. I also took the RV in to Georgetown to Mike’s Automotive. Mike’s a family friend and a great mechanic, so I always trust him to check things over before heading out on the road. I wish I had time to do more while I was there, like seeing more of my friends and having time to sell my car, but I completed most of my list before heading off. On Friday, January 4th, I took off across west Texas, heading for Quartzsite, AZ.